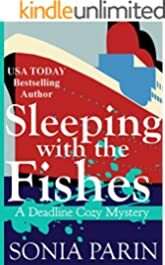 USA TODAY Bestselling Author Sonia Parin writes humorous cozy mysteries with quirky characters and entertaining dialogue. Her characters are described as realistic with a sense of fun, which is great because her aim is to provide lighthearted entertainment and pure escapism. She has a degree in Fine Arts and loves to cook and bake. "He deserves to be murdered." With her bitter divorce behind her, Eve Lloyd wants to relax and think about her next step. Paying her aunt, Mira Lloyd, a.k.a. Elizabeth Lloyd, renowned historical romance author, a long overdue visit, she plans to spend a month on Rock-Maine Island lounging around and plotting the launch of her new life. Her ex-husband, however, has other ideas. As for her aunt... she's gone missing. And now there's a dead body to contend with and a murder weapon with her fingerprints on it. A mantle of suspicion hangs over Eve and everyone she encounters has a reason to want her out of the way. 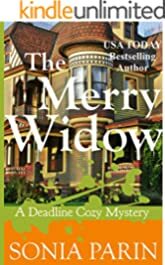 Unwilling to leave matters in the hands of swoon worthy Detective Jack Bradford... only because it's her civic duty to provide a new perspective, Eve Lloyd engages the assistance of her new friend and fellow suspect, Jill Saunders. 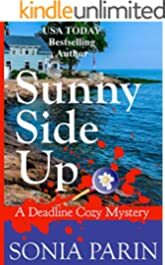 They both stumble their way through a long list of possible motives and suspects in a race to find the killer before either one turns into the next victim. Eve Lloyd, a death knell? Eve refuses to believe her choice of words had something to do with inviting a killer to the island, but just to be on the safe side, she agrees to avoid all use of any and all words related to killing. She's a prime suspect in a murder investigation. The timing couldn't be worse. She has a date with Detective Jack Bradford and the killer is threatening to ruin it for her. It's no accident. Eve Lloyd is a magnet for trouble. On the brink of settling into an uneventful existence, Eve Lloyd turns her attention to a new venture. She's going to open an inn and she thinks she's found the perfect house for it. It should all be smooth sailing from there, but she's developed a knack for landing right in the thick of it. 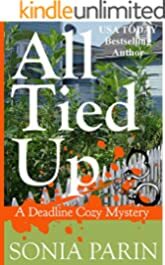 This time, she stumbles on a body in the least likely place and her fingerprints are all over the handcuffs found on the murder victim. As the suspects list grows, and the dream of running an inn evaporates, she becomes a target of the killer's rage. 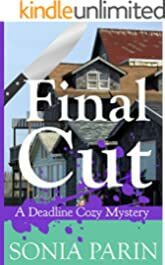 Despite trying to keep her nose out of other people's business, it seems the only way she can get her life back on track is if she sets a trap for the killer. Eve Lloyd's childhood nemesis, Charlotte McLain, is getting married. Nothing will induce Eve to attend. Nothing except... blackmail. She's been framed and despite trying to keep her nose out of trouble, she's now been dragged right back into the thick of it. The list of suspects is extensive, but she's sure she can narrow it down to... at least a half dozen people. "...What sort of business person would I be if I start killing off my guests?" 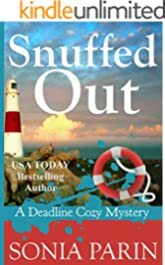 Eve Lloyd has settled into her new life in Rock-Maine Island and is about to open up an inn - a costly venture now that she has her heart set on getting an expensive custom made stove. Leasing her new house to a film director takes care of the extravagant expense. It should now be all smooth sailing. However, the director and movie star's endless arguing gives her a taste of what she might be in for when she opens the doors to the public. What if she gets an inn full of squabbling couples who use arguing as foreplay? But that is the least of her concerns. When a body turns up... in her kitchen, Eve thinks she might have to forego her new stove and spend her windfall having the house exorcised. Either that, or she could advertise her inn as an ideal retreat for killers on vacation. It doesn't help to have left her fingerprints on the murder weapon. Yes, she's a trained chef and yes, she knows how to use a knife, and yes, she might have said she'd do anything to get her new stove. But surely the police don't actually believe she's capable of killing someone...? Eve's new inn is about to open, with or without a name. As a new local business owner, Eve thinks it would be a splendid idea to attend a local town meeting. Little does she know she's been excluded from them for a good reason. She's been labeled a troublemaker. Now there is a new resident in Rock-Maine Island and she's been warned to stay away from him. One look at William Hunter the Third is enough to convince Eve she wants nothing to do with the man. Despite everyone's efforts to keep Eve away from him, the inevitable happens and he lands on her doorstep. To make matters worse, the billionaire brings along an entourage which includes his ex-wives, his friends and... a killer. 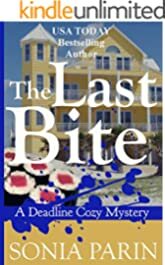 Humorous cozy mystery with Eve Lloyd, magnet for murder and mayhem. 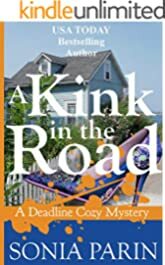 What can possibly go wrong when Eve Lloyd leaves her friend Jill in charge of the Seabreeze Inn and takes a day off to drive to the mainland with her aunt Mira? Well, despite being under strict orders to not buy any more furniture for her inn, she falls in love with a Quaker chair... or two, and some old cameras. She knows she'll be in trouble when she returns to the inn, but she doesn't count on landing in trouble because of a couple of chairs and some old cameras. The chairs lead her to the discovery of a body and the cameras set her up as bait for a killer on the loose. Add to that a happy-go-lucky hostess intent on drinking her way through a cellar full of champagne, a blackmailing ring and Jill's reluctance to leave her side. For once, Eve Lloyd has her back to the wall and no suspects to point her finger at.